Dayton, OH, February 21, 2019 --(PR.com)-- In response to increased demand for the Contract Manufacturing of 3D Printed Titanium Implants, Tangible Solutions is announcing the completion of a 6,000 sq. ft. expansion of their Additive Manufacturing (AM) facility. This expansion will support the Ohio-based company’s own growth plans to match market demand for their focused scope of AM Titanium Implants. The company reports that it has experience moving customers to 510(k) clearance from conception of design, and also transferring cleared devices from other vendors. “Our customers have been very complimentary about part quality, along with the level of attentiveness and support we provide. This expansion will only stand to improve the very things our customers desire most,” according to CEO Adam Clark. Company Overview: Tangible Solutions is Registered with the FDA, ISO 13485:2016 and ISO 9001:2015 certified. Founded in 2013, the company is focused on Orthopedic Implant OEMs who need a supplier focused on the medical device market. Tangible prides itself on providing value beyond 3D Printing (end-to-end services), and raising the bar in terms of part quality, on-time delivery, and customer service. 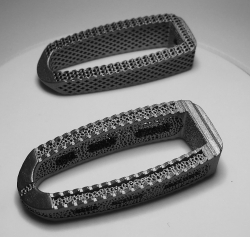 In response to increased demand for the Contract Manufacturing of 3D Printed Titanium Implants, Tangible Solutions is announcing the completion of a 6,000 sq. ft. expansion of their Additive Manufacturing (AM) facility.